Wolchulsan National Park is located in the southern part of Korea. 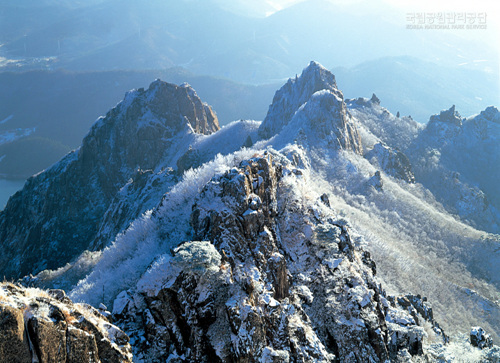 The name Wolchulsan means “mountain where the moon rises.” Starting with the Cheonhwangbong Peak (809m) at the center, the whole area is filled with rocky mountain peaks which all look special and unique. Walk for about 20 minutes past the National Park’s parking lot and Dogapsa Temple, and the entrance to Wolchulsan comes in to view. About 5km beyond the gate, you can see Gujeolbong Peak, shaped like nine large pots. Because this place always has water, it is said that a dragon used to live here. Another 500m further along you can see Maaeyeoraejwasang, a sitting Buddha statue, which is designated National Treasure No. 144. Just beyond the statue a path leading to the top passes through a lush green forest. When you reach the top of Wolchulsan Mountain, there is a large flat granite rock that can fit up to 300 people. Staring down from here gives you a great view of Wolchulsan Mountain. Climbing down from the top, you can cross an arched bridge, 120m from the ground, 52m long, and 6m wide. To the left of Sajabong Peak, around the middle of the mountain, there is a waterfall pouring down into the valley as seven separate falls on top of each other, called Chilchi Waterfall. On the way down to Dogapsa and Muwisa Temples, there is a field of reeds by the road that becomes spectacularly beautiful during fall. The sunset in the west is also beautiful beyond description. In the spring, the azaleas, in the summer the cool waterfalls, in the fall, all kinds of lovely colors, and in the winter, the snow covered mountains and valleys – Wolchulsan National Park is truly a wonderful site to visit all year around.